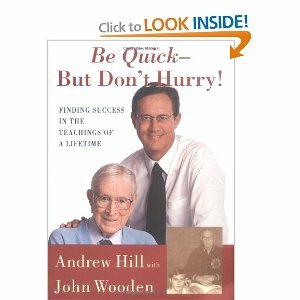 It’s been nearly 10 years since I first read Andrew Hill’s Be Quick - But Don't Hurry: Finding Success in the Teachings of a Lifetime ... a story from the life of John Wooden. I was talking with a golfing buddy the other day and suggested he read it. To my amazement, he approached me the following Tuesday to thank me. He said he couldn’t put it down and read the entire book over the weekend. That made me realize Wooden’s 21 secrets were fodder for a blog aimed at association executives and association volunteers. Perhaps the least controversial sports honor in living memory was the selection of John Wooden as "Coach of the Century" by ESPN, honoring his ten NCAA basketball championships in a twelve-year stretch. His UCLA teams won with great centers and with small lineups, with superstars and with team effort, always with quickness, always with class. Wooden was a teacher first and foremost, and his lessons -- taught on the basketball court, but applicable throughout one's life -- are summarized in his famed Pyramid of Success. Andrew Hill was one of the lucky young men who got to learn from Wooden in his favored classroom -- though that is hardly how Hill would have described it at the time. An all-city high school player in Los Angeles, Hill played -- a little -- on three national champions, from 1970 to 1972. Hill was left embittered by his experience at UCLA; he was upset at how unequally Wooden treated his starting players and his substitutes. Hill went on to a successful career in television, rising to the presidency of CBS Productions, where he was responsible for the success of such popular series as Touched by an Angel and Dr. Quinn, Medicine Woman. Hill's job required him to manage many creative people, with the egos and insecurities that usually go along with such talents. And one day, some twenty-five years after he graduated, he was hit with the realization that everything he knew about getting the best out of people he had learned directly from Coach John Wooden. With no small trepidation, Hill picked up the phone to call and thank his old coach and unexpected mentor. To his surprise, Wooden greeted him warmly and enthusiastically. A strong friendship, sealed in frequent visits and conversations, ensued, and endures. The team that makes the most mistakes ... WINS! These are a pretty good game plan for association executives and their work with volunteers, members and staff.